Jack Karadada belonged to the Wunumbal-speaking peoples, whose country is in the Kimberley between the Prince Regent River and the King Edward River. 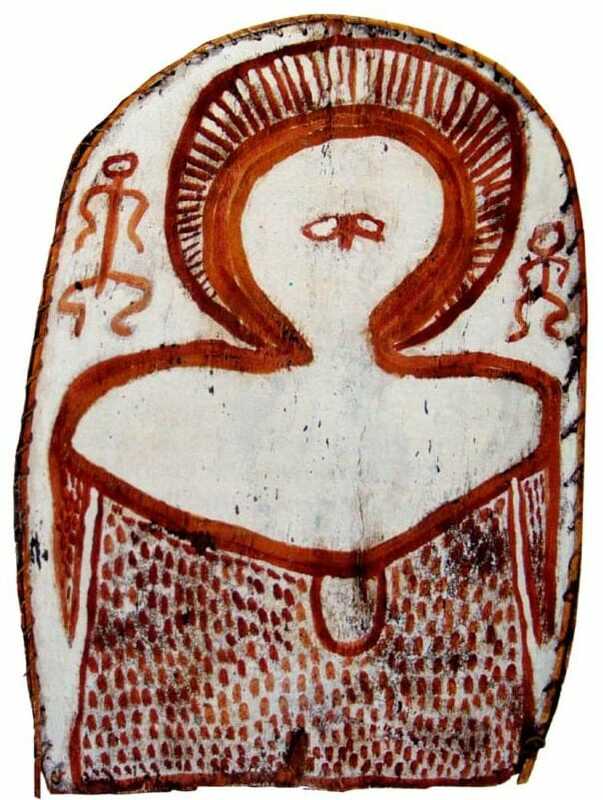 He was a traditional painter of Wandjina and leader of a family of Wandjina painters. He was married to RosieKaradada, his brother Louis was married to LilyKaradada. 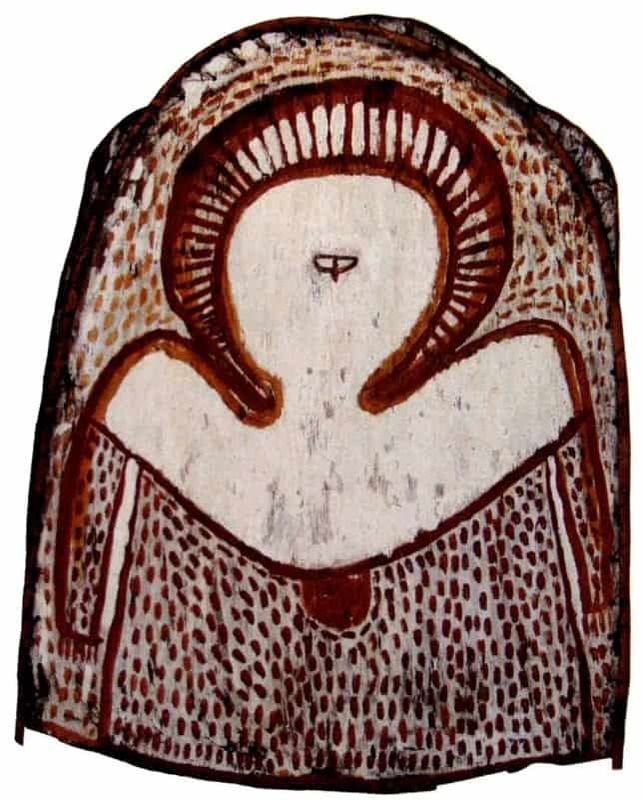 The aim of this article is to assist readers in identifying if their aboriginal bark painting is by Jack Karadada by comparing examples of his work. If you have a Jack Karadada bark painting to sell please contact me. If you just want to know what your Jack Karadada painting is worth to me please feel free to send me a Jpeg. I would love to see it. Jack Karadada paintings of Wanjinas can be distinguished from those of other artists by several features. The eyes of Jacks Wandjina are small and join each other. They are separated only by a single short brush stroke to represent the nose. His Wandjina are from the waist up and do not normally have legs. 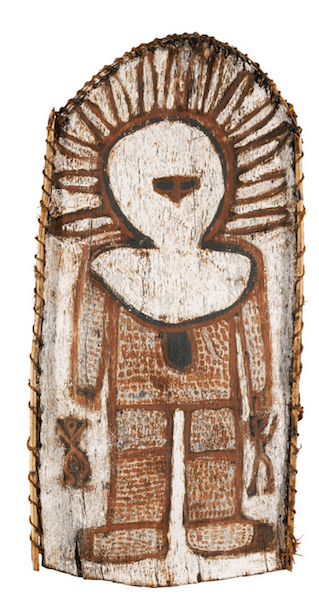 The majority of his Wandjina paintings are on an arc-shaped piece of bark framed across the top and down both sides by bent wood attached to the bark. Jacks wandjina are very similar to another of his brothers Kutwit Manila. With Jacks work the halo above the head is enclosed by a brush stroke and not free ended as seen with Kutwit’s Wanjina. The Karadada family are the most consistent and longest practicing family of artists from Kalumburu in the Kimberley. Jacks works though are some of the most sort after. There are far fewer examples of his work compared to those of his other family members. They are also more valuable. His Wife Lily was a prolific artist. As an initiated elder his works are of a high quality and have a raw supernatural presence. Jack was also an extremely proficient traditional artist in other areas. These arts include the manufacture of fantastic napped spear tips and shields. Jack was a pioneer Wandjina bark painter along with Waigin Djanghara, Numbulmoore and Mijelmarngu. Karadada is sometimes also spelled Karedada.